"What can I plant to get some privacy?" That's a common question to the garden radio shows, especially from homeowners with small yards...and neighboring two-story homes. 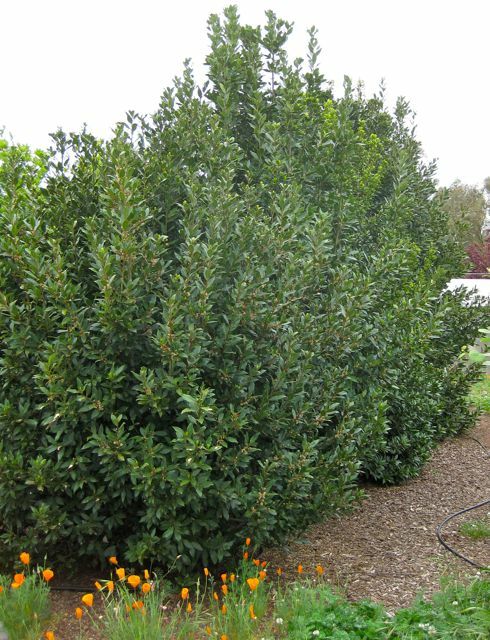 Here are some screening plants that can be a perfect fit for the Central Valley, lower foothills and the Bay Area of California. For quicker privacy, don't install these plants on the outer edges of your property. Plant them closer to the area you want to keep private. become a good screen. 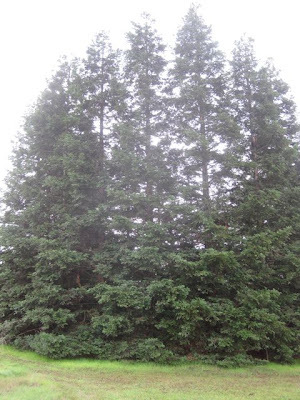 Be sure to plant coast redwoods at least 10 feet away from any fence or building. problems? Try the Australian willow (Geijera parviflora). This evergreen tree with long, narrow, drooping leaves gets about 25 feet tall and 20 feet wide. Incense Cedar (Calocedrus decurrens) 50-90' tall, 40-50' spread; evergreen; slow growth; takes heat, wind, drought. Sweet Bay (Laurus nobilis) 30-40' tall, 20-40' spread. Use its aromatic leaves for seasoning. Takes well to pruning. 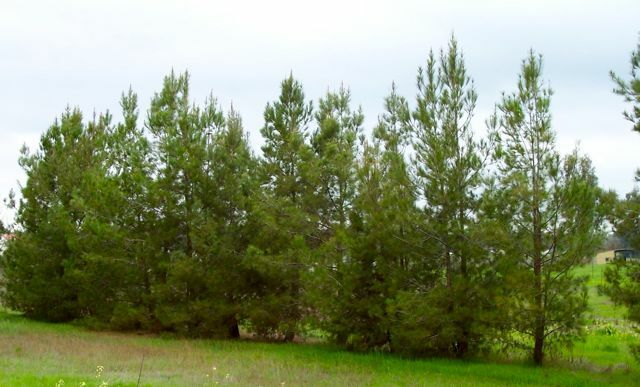 For a big yard, try the Calabrian pine (Pinus brutia or Pinus halpensis 'brutia' ) 30-80' tall, 15-25' spread. Fern Pine (Podocarpus gracilior). 20-60 ft. tall, 10-20 ft. wide. Thuja occidentalis "Emerald": 15 ft. tall, 3-4 ft. wide. Juniperus scopulorum "Skyrocket": 15-20 ft. tall; 2-3 ft. wide. BUT...junipers need easy draining soil and can suffer from a wide variety of maladies, including spider mites, aphids, twig borers and blight. For homes with planting areas about 15 feet wide, choose among these taller shrubs for privacy that do well in our area. Plant them at least six feet away from any building or fence. • Photinia (Photinia x fraseri). There's a reason you see these shrubs everywhere around here: photinia is a fast growing shrub whose established green leaves are complemented by the new, reddish-colored growth this time of year. Photinia makes an excellent privacy screen, getting eventually to 15 feet tall with an equal spread. For a smaller, slower growing variety, try the "Indian Princess". To get photinia to spread, pinch back new growth in the spring to encourage it to bush out. • Bottlebrush (Callistemon citrinus). This plant, which produces red, brush-like flowers throughout the year, can take our heat and poor soils. 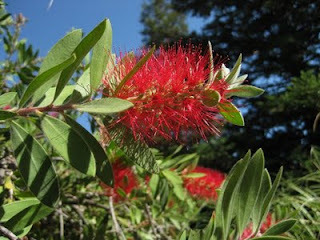 Bottlebrush is fast growing and easy to train. Its flowers are attractive to bees and hummingbirds; so, people with aversions or allergies to bee stings should avoid this plant. On the other hand, if you're looking for a shrub that can get as tall as 15 feet that will keep the hummingbirds in your yard, the bottlebrush is for you. • Evergreen Euonymus (Euonymus japonica). 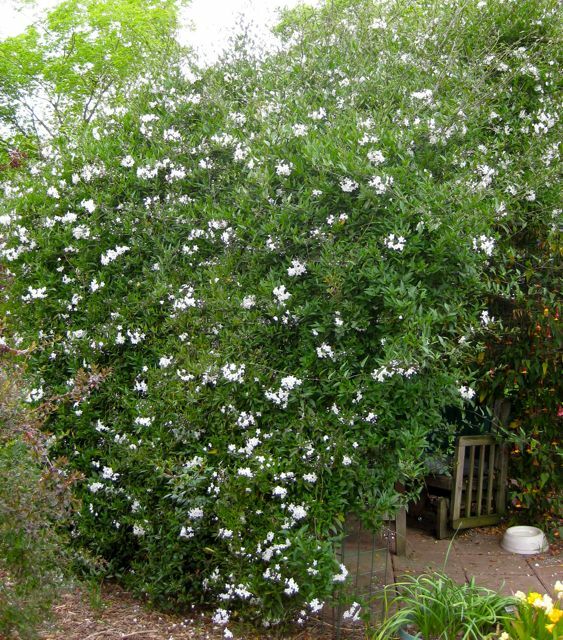 This plant gets 8-10 feet tall, and is considered a real garden "toughie". Euonymus can take lots of heat as well as poor soil. 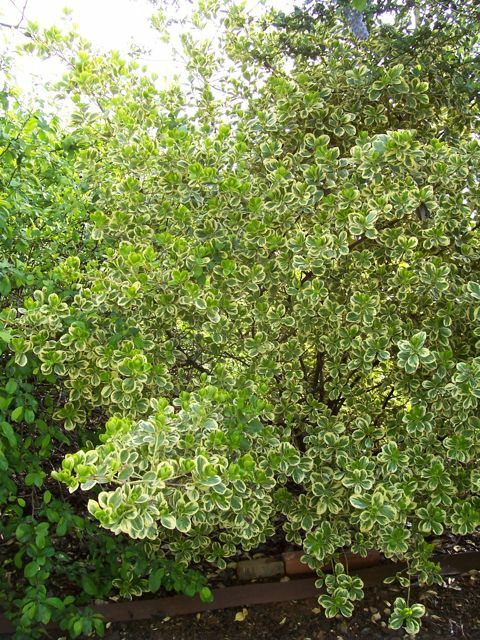 Many euonymus varieties have glossy, leathery, all-green leaves. But there are varieties that have more leaf color, such as the aureo-variegata, which has leaves with splashes of yellow surrounded by a green margin. • New Zealand Flax (Phormium tenax). Any plant that can thrive in our south Sacramento County yard, an area that gets heavy wind, high heat and can still prosper in our rocky, clay hardpan gets my vote for plant of the year. Our New Zealand flax plants not only survive in those conditions, but came through like champs during the extensive backyard excavation, grading and remodeling work that took place near their roots three years ago. New Zealand flax can get to nine feet high with a six to eight foot spread. The long, sword-shaped vertical leaves have a brownish red color; other flaxes have colors that range from purplish-bronze to yellow. New Zealand flax works well as a screening plant, hiding unattractive (yet necessary) backyard equipment such as swimming pool pumps and filters. 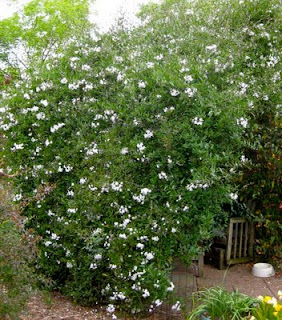 B. olhammii "Giant Clumping Timber Bamboo"
For narrow areas, a vine may be what you need for privacy. Construct a sturdy trellis, perhaps on a short wall or fence. A good, evergreen vine for that trellis in full sun is Carolina jessamine (Gelsemium sempervirens). It produces yellow flowers in the spring. 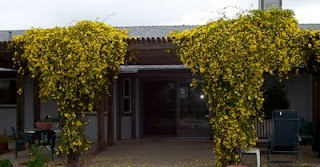 and star jasmine (Trachelospermum jasminoides). One note on clumping bamboo: It doesn't spread—right away. If you're planning on keeping it in the yard for, oh, say, two decades or more, it WILL spread. Consider a good plant barrier if you want to keep from annoying the neighbors. Don't forget the utilities when planting. It will save a lot of heart ache if planting is outside and encroachment areas. Watch for overhead lines. PG&E hires butchers to prune (read: damage). Clumping bamboo will NOT spread into your neighbors yard. The only way that would happen is if you planted it a few feet from the property line, and in that case, any plant would then be in your neighbors yard. I am looking for a plant that would provide a good Privacy screen barrier. 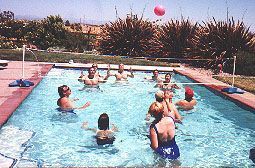 Recently bought a home, I can view neighbors all all 3 sides in the backyard. Bamboo sounds good,but also sounds to get a bit out of control. Bamboo can grow fast -- a couple feet a day. When my father left his lawn mower out next to the bamboo it proceeded to grow through the handle. The bamboo stalk had to be cut down before he could use his lawn mower again. Lol. 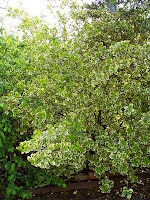 Pittosporum tenuifolium I use in my back yard along with the Bay Laurel and Arbutus marina. The Thuja occidentalis "Emerald" that you mention, I have seen it used many times and looks quite nice for a formal look or to block out a small view point. In 2005, I planted 3 "Spring Bouquet Virburnum" 5 ft. apart for privacy next to a side yard fence. They're now 12 ft. high x 6 ft. wide and beautiful. They keep their green leaves year round and today, January, I see new growth (red)in leaves and berry flower clumps. In early Spring, the red berries bloom into a sea of white flowers! 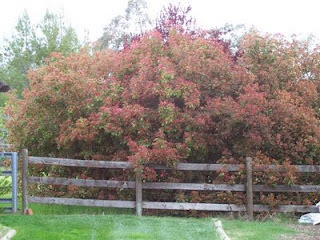 Also a great drought tolerant hedge that's easy to shape plus they're a safe place where the backyard birds love to live and raise their young.